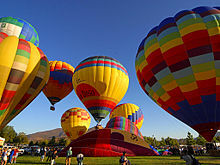 Many balloons have a basket, gondola, or capsule suspended beneath the main envelope for carrying people or equipment (including cameras and telescopes, and flight-control mechanisms). 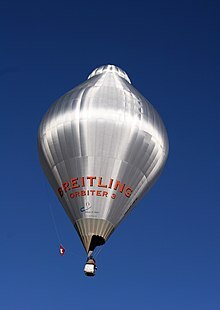 The first Italian balloon ascent was made by Count Paolo Andreani and two other passengers in a balloon designed and constructed by the three Gerli brothers, on 25 February 1784. A public demonstration occurred in Brugherio a few days later, on 13 March 1784, when the vehicle flew to a height of 1,537 metres (5,043 ft) and a distance of 8 kilometres (5.0 mi). On 28 March Andreani received a standing ovation at La Scala, and later a medal from Joseph II, Holy Roman Emperor. The earliest successful balloon flight recorded in Australia was by William Dean in 1858. His balloon was gas-filled and travelled 30 km with two people aboard. On 5 January, 1870, T. Gale, made an ascent from the Domain in Sydney. His balloon was 17 metres in length by 31 metres in circumference and his ascent, with him seated on the netting, took him about a mile before he landed in Glebe. During World War II the Japanese launched thousands of hydrogen "fire balloons" against the United States and Canada. In Operation Outward the British used balloons to carry incendiaries to Nazi Germany. During 2018, Incendiary balloons and kites were launched from Gaza at Israel, burning some 12,000 dunams (3,000 acres) in Israel. On 19 October 1910, Alan Hawley and Augustus Post landed in the wilderness of Quebec, Canada after traveling for 48 hours and 1887.6 kilometers (1,173 mi) from St. Louis during the Gordon Bennett International Balloon Race, setting a distance record that held for more than 20 years. It took the men a week to hike out of the woods, during which time search parties had been mobilized and many had taken the pair for dead. In 2015, the two pilots Leonid Tiukhtyaev and Troy Bradley arrived safely in Baja California, Mexico after a journey of 10,711 km. The two men, originally from Russia and the United States of America respectively, started in Japan and flew with a helium balloon over the Pacific. In 160 hours, the balloon named "Two Eagles" arrived in Mexico, which is new distance and duration records for straight gas balloons. ^ a b c The 4 May 1961 FAI Absolute Altitude (#2325) record for balloon flight set by Malcolm Ross and Victor Prather is still current, as it requires the balloonist to descend with the balloon. The succeeding altitude records were set by parachutists who either separated from or abandoned the balloon at the flight ceiling. ^ "Balloon Lift with Lighter than Air Gases: Methane". UH Manoa Chemistry Department. Retrieved 24 May 2010. ^ "Successful Flight Of NASA Prototype Super-Pressure Balloon In Antarctica". Space-travel.com. Retrieved 18 June 2011. ^ Von Glahn, Rick. "What we Do". Edge of Space Sciences. Retrieved 29 June 2012. ^ Joseph Needham (1965). Science and Civilisation in China: Volume 4, Physics and Physical Technology, Part 2, Mechanical Engineering; rpr. Taipei: Caves Books Ltd.
^ a b "FAI Ballooning Commission Achievements". Fédération Aéronautique Internationale. Archived from the original on 7 July 2010. Retrieved 11 April 2010. 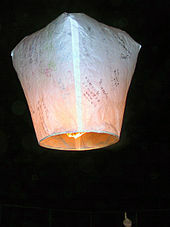 A list of notable balloon and airship flights has been assembled by Hans Åkerstedt from Sweden. The list has been compiled with much help from Troy Bradley, USA and Norman Pritchard, UK. Information from many other sources have also been used – FAI record files, personal log books and commercially available literature. ^ "CIA Notable flights and performances: Part 01, 0000–1785". Svenska Ballong Federationen. Retrieved 11 April 2010. Date 1709-08-08 Pilot: Bartholomeu Lourenço de Gusmão, Earliest recorded model balloon flight. ^ "CIA Notable flights and performances: Part 01, 0000–1785". Svenska Ballong Federationen. Retrieved 11 April 2010. Date 1783-11-21 Pilot: Jean-François Pilâtre de Rozier, First recorded manned flight. ^ "Grandi personaggi Paolo Andreani (1763–1823)", Aerostati.it On line (in Italian). ^ Nabben, Han (2011). Lichter dan Lucht, los van de aarde. Barneveld, Netherlands: BDU Boeken. ISBN 978-90-8788-151-1. Archived from the original on 4 September 2015. Retrieved 12 November 2011. ^ "A Voyage in a Balloon by Jules Verne – Free eBook". Manybooks.net. 18 June 2005. Archived from the original on 23 July 2011. Retrieved 18 June 2011. ^ "Dreamers, experimenters and balloonists". Discover Collections. State Library of NSW. Retrieved 4 December 2012. ^ Bruce, Eric Stuart (1914). Aircraft in war. London: Hodder and Stoughton. p. 8. Retrieved 4 November 2009. ^ "Balloon launches breach North Korea's bubble – science-in-society – 01 March 2011". New Scientist. Retrieved 18 June 2011. ^ "Helium balloons float propaganda into North Korea". CNN. 31 May 2010. Retrieved 18 June 2011. ^ a b "The Extraordinary Nazca Prehistoric Balloon". Julian Nott. Archived from the original on 14 July 2011. Retrieved 15 October 2011. ^ Julian Nott (March – April 2003). "History Revisited: Julian Nott Reprises his Flight over the Plains of Nazca" (PDF). Ballooning. Retrieved 15 October 2011. ^ The International Air Sports Federation (FAI). "Ballooning World Records". Archived from the original on 25 January 2016. Retrieved 15 April 2016. ^ The International Air Sports Federation (FAI). "Ballooning World Records". Archived from the original on 8 September 2016. Retrieved 20 March 2015. ^ Japan Aerospace Exploration Agency. "Research on Balloons to Float Over 50km Altitude". Isas.jaxa.jp. Retrieved 18 June 2011. ^ Greg Botelho. "Research on Balloons to Float Over 50km Altitude". CNN. Retrieved 2 February 2015. Wikimedia Commons has media related to Balloon aircraft.